MARY LYN RAY has written many acclaimed books for children, including New York Times best-seller Stars, illustrated by Marla Frazee; Pumpkins, illustrated by Barry Root; and Red Rubber Boot Day and Mud, both illustrated by Lauren Stringer. She lives in South Danbury, New Hampshire . Visit her website here. Each of us has our own ambitions when we are young, and the entire world seems to be in front of us. Some, like me, want to be teachers, some want to be doctors, some want to travel the world, and some, like Elva, want to play the violin. Once we have our dream determined, we look to our parents for approval. This is where Elva's dream ends, but only for a while. 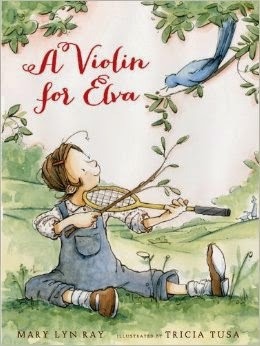 Outside, Elva hears the beautiful sound of a violin, and she immediately knows she wants to learn to play. Unfortunately, her parents tell her "no," and Elva is forced to pretend. But like all children who grow up, Elva must leave her dream of playing the violin behind to focus on a job and adult priorities. Still, the faint sound of the violin calls to her sense of nostalgia. For an age group of 4-8, Ray gives readers a glimpse into childhood wonder that many adults wish they could hold onto. We have all had a dream once that didn't come to fruition, but Ray's message of doing what you want to do for yourself gives many young people hope. What at first appears as a bleak message of letting go of dreams ends in a message of retaking that dream and bringing it full circle. Paired with Tusa's watercolor illustrations that portray charm and innocence, Elva's dream represents every young child's dream at one point. While the book's intended audience is young, many parents would find this delightful book appropriate for themselves or other family members.